As an owner of 1 Source Office Furniture in Baltimore, Maryland, I devote much of my effort to clarifying people’s thoughts, goals, and misconceptions about office furniture. CEO’s of growing companies choose 1 Source for mid-priced, value-driven products for all areas of the workplace. We help office furniture buyers understand which products are best for their workplace, based on the needs of their staff and the office they will occupy. 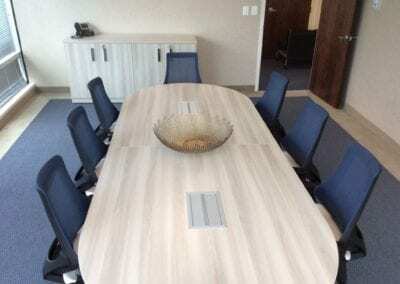 To help with the process of choosing and purchasing office furniture, I have provided some common questions and answers. What size furnishings will fit in my office? Solving spatial dilemmas is among the most important things an office furnishings specialist does. 1 Source Office Furniture has the experts who come to your business location to measure and discuss what size products will fit and function best for the needs of the entire staff. Do you know that a ten-foot conference table will fit eight people? Do you know there are specific clearances needed for doors and chairs in a meeting room or other office area? When custom sized furniture is needed, LogiFlex (in Canada), is just one of our go-to-sources for custom laminate tops, conference tables, desks, and reception counters. This initial consultation and space plan are complimentary because it is important for clients to hear all of their best options when planning a newly furnished workspace. Which brands or manufacturers are best for me? Our job as an office furnishings specialist in Maryland is to search all of our available lines and products to present the ones that best fit the needs of each project. 1 Source Office Furniture’s specialists can find the right products based on more than 38 years of commercial furnishings experience. Tell your office furnishings dealer in Maryland whether you prefer furniture that is American-made, green (environmentally friendly), quick-ship, or anything else that may be important in the final decision. 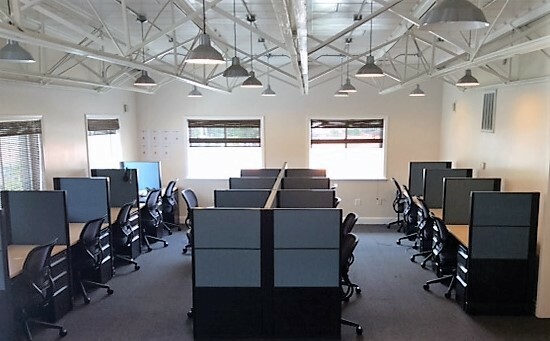 1 Source Office Furniture is Baltimore’s leader in mid-priced business furnishings since 2010. 1 Source sells furnishings that business owners don’t typically see in a dealer showroom. When office furniture buyers want the major brands, including HON, National, 9-to-5 Seating, All Seating, Open Plan Systems, and LogiFlex, 1 Source has a wide selection. A brand name is kind of like a favorite pair of jeans; it’s not about the label so much as how well they fit you and look good year after year. Should I buy modular office furniture? Modular office furnishings are a great choice for growing businesses. Why? Because desks or workstations can be modified, reconfigured, or changed in some way over time. As a company’s needs change, there may be no need to replace all of the office furniture. A simple swap changes a right-return L-shape desk to a left-return L-shape desk and voila, it’s ready. 1 Source also recommends mobile file pedestals because they can pop in anywhere, switching from right to left side at a desk or any other place within the office. With the addition of an upholstered top, the mobile pedestal doubles as a seat. 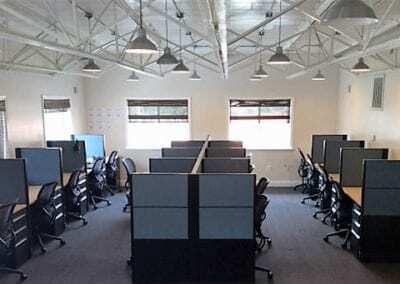 Many office furniture manufacturers have modular products and that’s why this is a great time to invest in quality office furniture in Maryland (or beyond) which will handle the needs of your growing business. Are workstations right for my office? Private workstations and benching (a minimalist system which is modern and clean-lined) are excellent choices for CEOs who want to maximize their office space because these systems fit in more people than ordinary desks. In addition, benching systems place everything, phone, IT and HDMI at the work surface. 1 Source has workstations and benching by Open Plan Systems, LogiFlex, Friant, and AMQ Solutions. Many of these products have sit-to-stand option so that employees can adjust their desks to work in comfort all day. Is office furniture financing available? Business owners and office furniture buyers throughout Maryland face a lot of expenses when they decide to expand or to move into new offices. 1 Source Office Furniture offers convenient options for financing, such as lease arrangements and, of course, major credit cards. Furniture financing enables office managers to get the products they need to fill a new office, without interruption of cash flow. How long does it take to get furniture after I order? Product lead times for delivery vary from one manufacturer to the next. The experts at 1 Source suggest office furniture buyers begin 10-12 weeks before they expect to move into a new office or 6 weeks for small orders for an existing office. These suggested timelines allow for consultation, proposal, revisions, and delivery of all the desired furniture. In addition, some manufacturers offer select chairs and desks by quick ship when the time is short. 1 Source Office Furniture is located in Phoenix, MD. Visits to our Elkridge, Linthicum and Washington DC showrooms are by appointment only, but we will come to your office for a consultation!